Mitski is the star of a new short film by writer and director Emily Yoshida, a Spin contributing writer and film critic at New York Magazine. 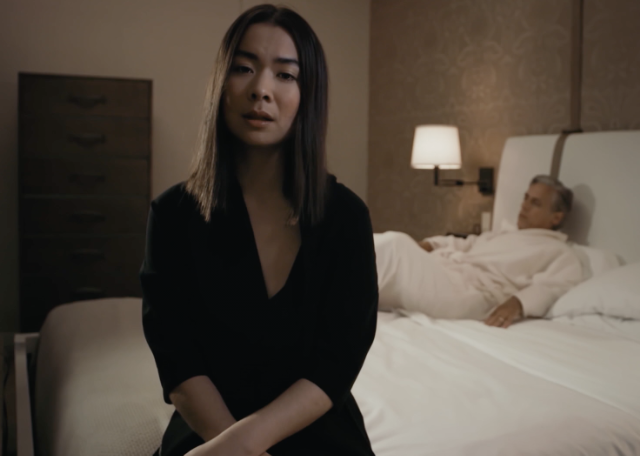 Yoshida’s short, Sitting, follows Mitski’s character, who is nameless (credited as “Our Heroine”), as she distributes a mysterious pill to various clients to help them “get raptured.” As a part of this more-than-slightly intense job, she comes to odd hotel rooms, including that of Mr. Branson, an aging celebrity contemplating a senatorial race. She hits the floor of clubs to ply her wares and “[watch] strangers meet God.” In the middle of the short, Mitski also sings “Thursday Girl” from Puberty 2, her breakthrough LP from last year. Watch Sitting below. SITTING: A Short Film from Ceremony on Vimeo.